The client works towards a safer future by manufacturing reliable, affordable, and easy-to-install wireless infrastructure for buildings. A multinational corporation based out of New York City, the company’s Tactical Series line of products operates at the nexus of two-way radio and fire-alarm systems, speaking the language of both. The company is FDNY ARCS B-03 certified, providing unmatched experience at getting installations for US FD by UL and FCC. The company has a wide resellers network: Siemens Building Technologies, New York Fire Detection Inc, National Fire Products Inc, etc. Tragic losses of life have highlighted the need for vast improvement in the coverage and dependability of emergency communications, especially inside buildings. So the client required the creation of an auxiliary radio system Command and Control center for First Responders which would allow for a better radio signal, monitor its condition in the cloud, and which would be easily-installable and flexible for each reseller’s requirements. 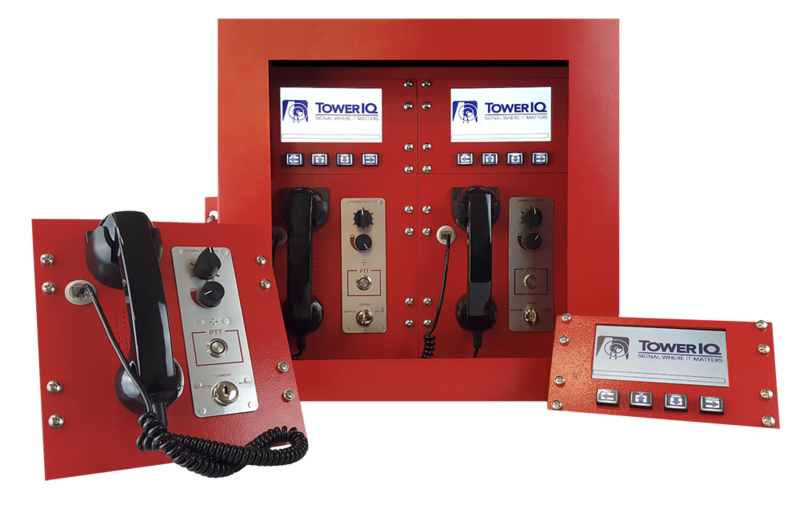 Our team created an In-building Two-Way Radio Communications Enhancement System with a dedicated radio console and cloud solution. It was certified US FD by UL and FCC. Its main purpose was to ensure that firefighters would have uninterrupted communication. The cloud solution provides different access levels and allows for status monitoring of the system’s availability and prompt response to any unanticipated problems. The cloud solution also provides a flexible set-up for any system’s indicators and can send smart notifications in the event of an anomaly. The radio system was created for a customer who has a wide resellers’ network and it needed to be very flexible and easily customizable for each reseller’s requirements. Our system has the easiest installation on the market today and is designed to be easily extended with any additional sensors or actuators in the future. The product was designed as immediately ready-to-use given the great importance of radio coverage systems. Also, user manuals were prepared and we provided training for firefighters and resellers. Our team was responsible for all phases of the product’s hardware and software development, which was designed from scratch. Our engineers support the manufacturing process (we provide the manufacturer with full PCB’s documentation and make changes to boards’ prototype on demand). After the product was released to market, another contract was signed with the customer to develop an advanced active radio coverage system within an additional wireless network for consumer purposes. DRC (Dedicated Radio Console) which is equipped with two sections, each occupying half of it, one for two (11 and 12) FDNY radio channels. Each section consists of two parts: the communications panel and the system GUI panel. The DRC is outfitted with a 6,5” TFT monitor. It’s maintained for firefighters and allows them to check the essential elements (radiostation condition, selected radio channel, volume level) and the general system conditions (console’s availability status, network settings, power supply check, ground fall detection etc. RAU (Radio Amplification Unit) which ensures radio system operations and a Radio Amplification Monitor (RAM) module to monitor against vandalism, earthquakes, overheating and high humidity. Antennas and Cables which are located on each floor of the skyscraper. 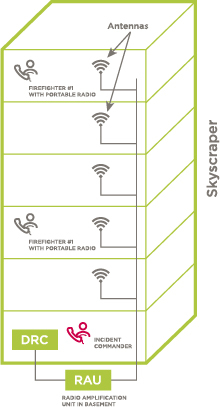 Their main purpose is to equip firefighters with a stable and continuous radio connection. All cables and antennas are fireproof for at least two hours and can withstand water pressure. Cloud System which ensures remote firmware updating and provides the radio system with centralized data storage. and decoding, voice transmission, base station control, GUI rendering and data storage. The core boards are fitted with Ethernet-capability that units use for communication, and also with a dedicated RS485 interface to allow reporting of the system’s state and communication to the building’s NFPA alarm. performs crucial real-time decisions, like switching sound devices depending on the handset and its condition. It reports all collected data to the core board via UART interface. The sensors board is a satellite board based on an STM32 microcontroller that performs monitoring with a number of sensors such as earthquakes, overheating and high humidity. Our team supports the manufacturing process (we provide the manufacturer with full PCB’s documentation and make changes to boards’ prototype on demand). CSU is responsible for base station communication via DFSI, handling audio input and output (audio hardware is found on the in-house designed extension board «CCCP») and controlling environment sensors (CSU may have a «CEU» extension board), providing the user with a GUI interface. CSU does not perform any major decisions, relying on RAM to accept its data and provide settings and instructions accordingly. The Cloud Service is responsible for wide-scale coordination of installations and providing various users (members of fire departments, authorities, building owners, technicians, etc.) with relevant data. To prevent unauthorized access to data, a sprawling permission system is implemented, governing which organizations and user groups inside them may access which data. The highlights of the cloud functionality are online reporting on the state of each active installation for real-time monitoring via a web browser, configurable notification service, a sophisticated interface for installation configuration (for example, it is possible to configure a never-before-seen SNMP-capable device for use in an installation, or set up a menu configuration for the GUI completely from scratch) and the certification service (ensuring no unauthorized modifications are made to installations). The cloud service is hosted by Amazon Web Services making use of AWS’s email and SMS systems for notifications. Two-factor authorization via password and SMS is mandatory. From the security side, all communication between the installation and the cloud are secured using SSL protocol, communication with end users is secured using HTTPS mechanisms, and all voice recordings are encrypted using asymmetric algorithms which allow for the storage of the encryption key and encrypted voice but requires a decryption key to decrypt the voice. The cloud dashboard provides extensive tools to the controlling user and group privileges regarding specific installations and the overall system. There is also installation ownership transference to support migration from one reseller to another with zero downtime in terms of support. All in-building installation maintenance should be triggered from the cloud first, all other intrusions will be treated as vandalism. Except for these functions, one of the main advantages is that the system provides extensive tools to the controlling user and group privileges regarding specific installations and the user’s access level. Our solution has been quickly adopted in NY buildings and immediately generated income for the customer. The system was certified for US FD by UL and FCC. The solution is flexible and meets the requirements of any reseller, which allows for its expansion into wider markets.